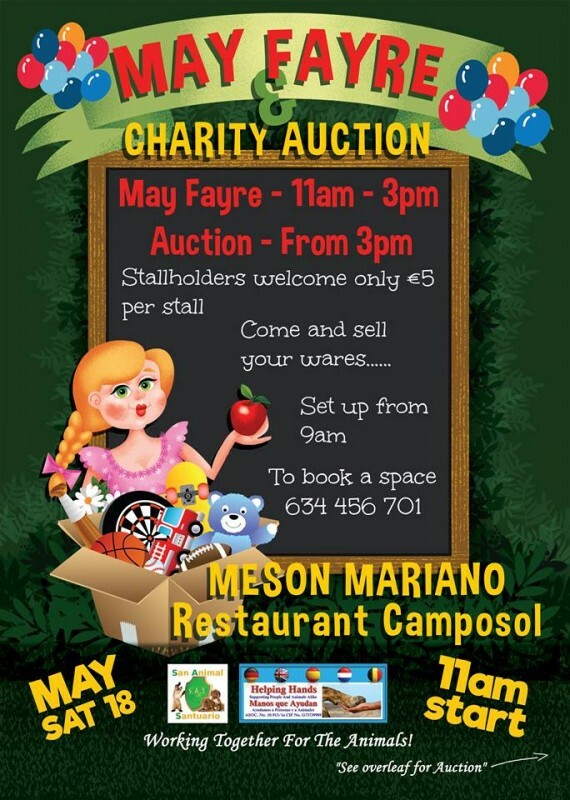 Helping Hands are holding a charity auction and May Fayre at Meson Marianos Restaurant on the A Sector of the Camposol Urbanisation on Saturday 18th May, with the 10% commission raised on the sale of the goods from the auction donated to help this local charity. To register goods for sale or to book a stall at the May Fayre call 634 456 701. Set up from 9am. Fair open from 11am to 3pm. 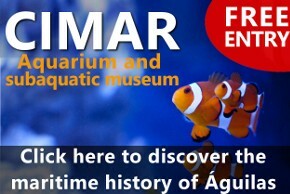 Auction follows afterwards from 3pm. Helping Hands is based in the Águilas municipality, in the south-west of the Region of Murcia and offers assistance to animals and people alike in an area encompassing the Águilas and Lorca municipalities. The charity is multi-national, volunteers comprising a variety of nationalities from all walks of life, working together to offer assistance where it is needed within the local community. Founded in May 2011 the principal activity of Helping Hands is to offer help by rescuing abandoned, mistreated and lost animals, responding to calls from locals finding animals in distress and ensuring they are treated and cared for in the most effective way possible. Fostering and rehoming is their ultimate goal when offering help to these animals and volunteers are always welcome to come along and assist in their rehabilitation; foster homes are also needed to accommodate abandoned and abused animals in the southern part of the Murcia Region. They also extend their ”Helping Hands“ to supporting people in immediate need, as witnessed during the devastating earthquake of 2011 and the floods which followed the Gota Fría of 2012. Helping Hands launched an appeal and were able to provide hands-on assistance and supplies to many who lost possessions and others who lost their entire homes. The Charity organises regular events to raise funds, which are held locally in the local area and include music nights, hypnotist comedy nights and daytime fayres with stalls and fun to be had for all. Helping Hands Charity Shop in Águilas raises funds selling pre-loved goods, and all donations of items which can be re-sold are gratefully received. Helping Hands is totally self-funded and by public donations and regular fund raising events, receiving no official financial support, so monetary donations are always welcome to cover food costs, vets fees, transport and often kennelling and training.